TNC e-Sports, one of the renowned gaming organization in the Philippines is set to reach greater heights. TNC e-Sports Cup – The Grand Finale 2015 will be happening this coming November 28 & 29, 2015 at Cuneta Astrodome, Pasay City. This will be the first time in the e-Sports history that an e-Sports event will be held in a sports arena. After a successful run last year, The Grand Finale 2015 will definitely be bigger and better. A total upgrade from venue, production up until to the tiny details has been done. Expect an overall thrilling e-Sports experience. Premium passes are now available to the public sold at 150 Pesos each. The passes will not only allow your entrance to the event but will include some awesome items such as in-game items, ballers, lanyards and a chance to win premium items like shirts, limited edition mouse pads and more! The event will mainly feature the grand finals of the yearlong e-Sports tournament of TNC. Three (3) gaming titles will be played namely Dota 2, League of Legends and Crossfire. A total of 24 teams are qualified in the main event (8 teams per game title). Cuneta Astrodome will be the main battleground to determine the best team in their respective titles. 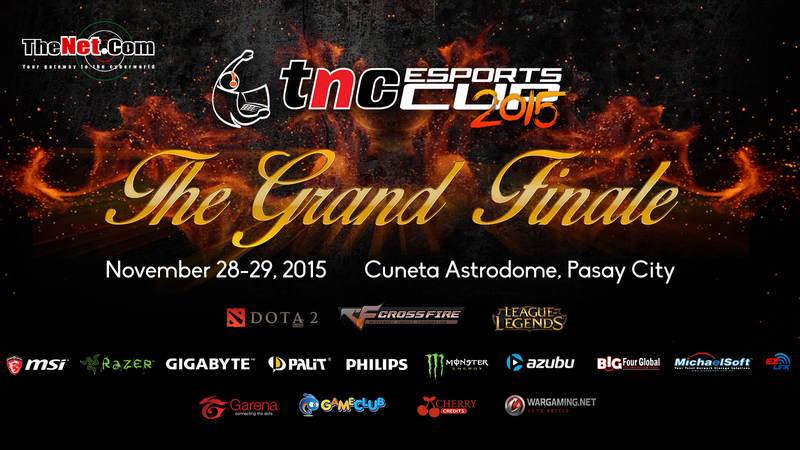 The TNC e-Sports Cup – The Grand Finale 2015 is fully supported by TheNet.Com, Gigabyte, Palit, Philips Multimedia Display, Monster Energy Drink, Converge ICT, Celebrity Lounge, Razer, MSI, Gameclub, Garena, Cherry Credits and Wargaming. More updates will be released soon for the TNC e-Sports Cup – The Grand Finale 2015 so be sure to keep posted by visiting the following channels of TNC. ASUS ROG GR8 Review: Better than a Gaming Console?